Event Description: An exciting place to participate in a corporate teambuilding event, Ocean Drive in South Beach has been called a “safari through the trendy”. And that it surely is — a mish-mash of chic clubs and restaurants populated by actors, models and wannabes. But palm-lined “SoBe” is so much more than the Florida Riviera. Location History: A vibrant combination of Hispanic, Caribbean, Italian and Jewish cultures, Miami’s South Beach is also the unquestionable world’s center for Art Deco architecture, with more than 400 registered historic landmarks. During your corporate teambuilding treasure hunt…which begins near the Loew’s hotel on 16th and Collins and winds its way along the beach and environs, you’ll stop, perhaps, at the rollerblade-up bank on Washington St.; the plaza of a dozen turtles; the splendidly deco Cadet Hotel; and a building named after an Egyptian god. 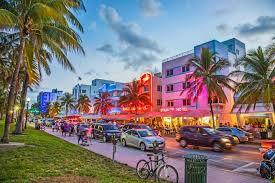 Feel the treasure hunt rhythms in hot-hot-hot South Beach, Miami.